I have heard that this had less to do with cost than with (I think) bureaucracy. The key aspect of the tanks was that they were already certified for flight, whereas any new hardware would have to be certified. I think (my memory is hazy on this) that it was not really a cost issue, but the time required to certify any new hardware. After ISS is pushed into the Indian Ocean the Navy can go and retrieve the tanks for Endeavour. Who says they aren't working on all that in addition? It would be foolish not to provide for the short term while continuing to work toward a system of tighter reclamation. Were these tanks ever removed and re-installed between actual Shuttle missions? Who does the Navy send the bill to for that? Thanks, that answers my question about the status on the tanks of Atlantis. Any other parts of the shuttle they could recover without affecting the hull? There's probably little interest for the fuel cells, but other parts? From the text, it appears that NASA now has eight water tanks from Endeavor and Atlantis that will be launched full. Do they plan on disposing of them when they are empty or return them for reuse? Single use would mean the whole effort would bring up about 800 liters of potable water. How does that compare to the annual water budget? How much water is being sent up each year? Will it just be easier for the astronauts to plumb in these tanks than it is to transfer water from the bags in which it is currently launched? "The Endeavour waste water tank was shipped to the Kennedy Space Center for removal of some sensor and wiring components that will serve as spares for the storage system,"
It looks to be a permanent fixture for the ISS. I would imagine they will create a new plumbing system and use them (likely) in lieu of the PWC they now use (which do tend to leak, new or used). 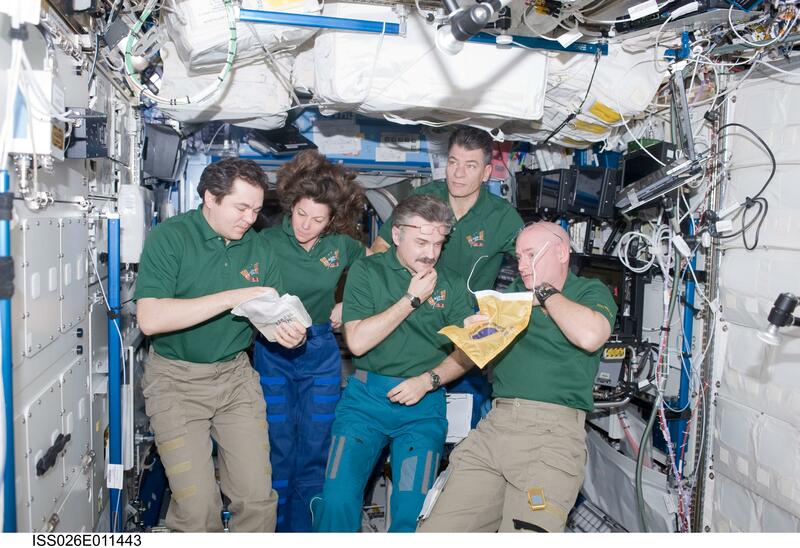 So the question is (since space is at a premium on board the ISS): where will they be mounted? It has to be inside, and though they 'could' move them into position for re-filling the system, one would imagine a permanent location is best. I'm guessing a ZSR near the recycling center or galley, its' just a matter of storing the ZSR Spares stuff in another location like the PMM. Nasa will probably make a mounting system and plumbing to attach the tanks into the current water system where they can be refilled quickly. They seem to be the right dimensions to all be placed into one or two racks and plumbed up roughly the same as they were in shuttle. Those are only for soft goods and such. An ISPR or similar would be more likely. The eight shuttle potable water tanks, each with a capacity of almost 20 gallons (75 liters) would provide 158 gallons (600 liters) of water storage capacity. Crew members on station typically consume about a gallon (3.8 liters) of water a day, so this new storage capability would provide roughly 25 days of reserve water for a typical U.S. segment crew of three. The water storage system rack will most likely reside in the U.S. laboratory due to available connectivity to the station’s existing potable water plumbing. Jim, you should know this. I expect more from you. ZSR's (Zero G Storage Racks) are made of a generic and empty ISPR. "For both hard and soft goods" Usually configured as MDL compatible. The center bar can be removed to accommodate wide articles... Soft covers are usually shipped with the empty rack or on another resupply mission. There is nothing similar to an ISPR. Japans ISPR, and NASAs ISPR are virtually identical. Hence "International" Cut from the same engineering drawings. Fluid/Electrical Connectors vary, not the ISPR. No other partner has made anything "similar"
MPLMs, Cygnus's "storage racks" are permanent fixtures inside those PMs, not removable like the ISPRs that are often shipped inside them. The "Storage Racks" have roughly the same dimensions but again are not removable. A ZSR will likely be emptied to accommodate modification for use with the water tanks as noted above. It was and still is an educated guess. "Project details and plans still are being finalized"
What evidence do you have to support your "similar" rack? My "evidence" is that I have work on ISPR's and ZSR's which beats "empirical book evidence". There would be no ZSR to be "emptied" because a ZSR is an insert in replaces an ISPR and is for soft stowage like CTB's and such and not hard and heavy items. The ZSR would be removed or even another rack emptied and the water tanks would be hard mounted in the ISPR. At over 160lbs, a full water tank with connectors and such is something that that would require better restraint than a ZSR. This is the 1g equivalent of a ZSR. The MPLM (Shuttle2008)shot illustrates both types, and Piggy Back Pallets (6 soft type with containment boxes)and bungee restraint. There is also a net(web) restraint. I doubt they would use any of these methods for the water tanks. IMHO, I doubt they will use shelves, more likely "V" brackets on braces like those used in the shuttle image you provided. Yes of course they will be hard mounted, and hard pluming is likely too. Again IMHO. "Project details and plans still are being finalized"
P.S. Empirical evidence is irrefutable, that's why it's empirical! Photo-documentation provides knowledge to those without direct access to the genuine article. We all can't be "Jim" now can we? There is no such thing as a Hard ZSR. That is just a stowage rack (which some times was an ISPR). ZSR were designed for use in zero g and to replace ISPR. They were light weight and could be launched in a collapsed state. They were only design to handle orbital loads. And they were based on the 1 g closet insert concept. No, those are resupply racks and resupply pallets. They are designed to handle the launch loads, but they stayed on the MPLM and only the stowage (contents) moved to the ISS. 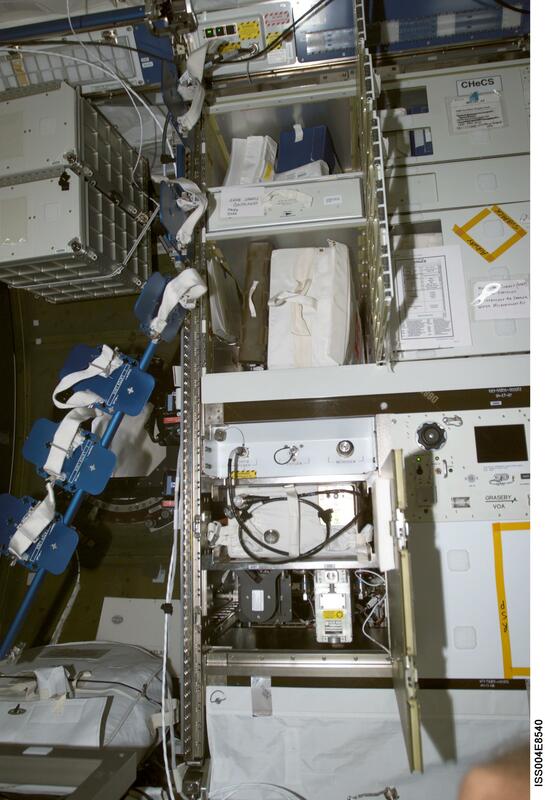 So is it fair to assume a rack will be modified for this purpose on the ground and then flown to station aboard HTV?